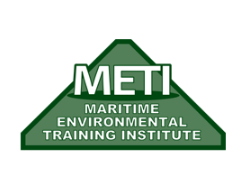 Maritime Environmental Training Institute (METI) is a private career college, providing occupational, environmental health and safety training through their accredited and industry-approved full-time programs, safety courses, safety services, and in-demand online training. METI’s training is geared to provide students with the knowledge, skills and certification needed to meet the requirements of a person employed in a variety of industries. METI is centrally located in Sydney, Nova Scotia (Cape Breton) and occupies 18,000 square feet along with a modern training yard, measuring 2.5 acres, making it an ideal setting for your safety training, safety courses, safety certification and safety services.